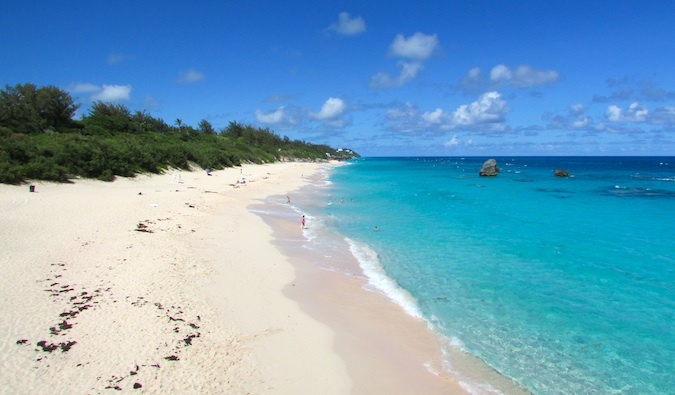 Is it possible to travel around Bermuda on a budget? When I was 12, my father took my sister and me to Bermuda to surprise my mom, who was there on a cruise with my grandmother. We spent four days sweltering in the heat, swimming at the beach, and eating at Henry VIII (where my dad swears I told a girl she had nice hooters. I still don’t believe him). And now, older (and not that much wiser), I wondered: could the land of rich people, celebrities, bankers, and tax-avoiding corporations really be enjoyed on a budget? Bermuda isn’t known as a cheap destination. Being the frugal traveler I am, I didn’t want to spend much money, but what’s the absolute minimum one needs while there? Way more than the $50 a day I suggest. After my four-day visit there, I can tell you that it’s nearly impossible to visit Bermuda on a budget. Realistically, you need at least $175 USD per day. Secondly, transportation around the island is difficult. The bus system here, while cheap, is infrequent, and many routes stop around 7pm. If you aren’t staying in a central location, this can be problematic. Additionally, taxis are expensive: a short 10-minute ride can cost $20 BMD. All taxis are fitted with a meter, with prices starting at 6.45 BMD. Each subsequent mile will cost you 2.75 BMD (though there is a 25% surcharge on Sundays). And if you’re visiting far-off beaches and attractions or coming back late at night, you’ll definitely need a taxi. You’re guaranteed to take at least one taxi ride a day. So is there any way to visit Bermuda cheaply? Book early – If you want cheap accommodation, you’ll need to book rooms at least a month in advance. Avoid hotels and resorts and instead stay at a bed and breakfast or home rental property. If you’re staying with a group, definitely rent a large apartment, as it’s far less per person than a hotel room. Couchsurf – There are only 46 Couchsurfing hosts in Bermuda. Many of them have private rooms available, but if you want to succeed in reserving one, make sure you inquire really early in order to maximize your chances of success. Rent a motorbike – Motorbikes are the most convenient and economical transportation on the island. Since buses are infrequent and taxis expensive, having a motorcycle will give you more freedom to travel at a lower cost. Motorbike rentals begin at around $50 a day but get cheaper the longer you rent them; four days will cost an average of $35 per day. Two popular rental companies are Elbow Beach Cycles and Oleander Cycles. Mopeds are easy to rent and you can expect to pay around 50 BMD per day. Stay central – While Hamilton is not set on a beautiful, pink-sand beach, it’s the center for all the buses and ferries leaving the city. If you rent an apartment and aren’t careful, you can end up somewhere far from a bus stop (which means more taxis). Staying in or near Hamilton will ensure you’re near all the bus lines and can avoid spending too much money on taxis. Skip the fancy food – There’s good food on Bermuda, but it’s expensive. Avoid all the big, fancy restaurants (OK, enjoy one nice meal) and go for smaller stalls and local restaurants where prices, though still high, are more economical. My two favorite places were Specialty Inn and North Rock Brewing Co. Additionally, the cafe at Cambridge Resorts is reasonably priced despite being at a resort. Most meals will cost $10–20 USD. Cook – If you skipped the hotel and rented an apartment, you’ll have a kitchen. There’s an ever-growing local and organic foodie scene on the island. You can find a lot of cheap fruits, vegetables, and meats at markets and shops, which will help lower your costs dramatically. 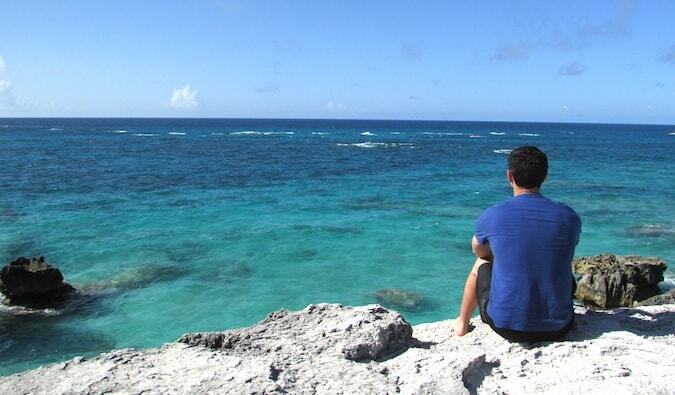 Overall, if you find a Couchsurfing host, you can probably do Bermuda for around $70–80 USD per day. Otherwise, you’re looking at around $175 per day. Despite the drain on my wallet, my trip to Bermuda was amazing. 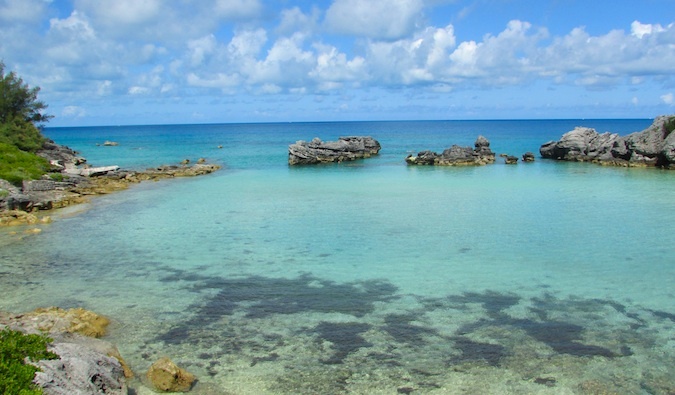 As you can tell from the photos, everything you’ve ever heard about Bermuda is true. This is truly an island paradise, with warm, clear water lapping pink-sand beaches. So visit Bermuda and know that while it won’t be cheap to visit, it will be beautiful, relaxing, and fun!